The Dual XGPS150A brings GPS capability to your Apple iPad/iPod touch/iPhone, Android phones and tablets, Blackberry phones, Windows devices and laptops running Windows, OS X or Linux. If you have several phones/tablets/laptops in your household, and you’re looking for one GPS to work with them all, the XGPS150 is an excellent choice. The Dual XGPS150 works with popular electronic flight bag apps including EFB, ForeFlight, WingX Pro, and many others. The Dual XGPS150 is very easy to use. Once you have paired via Bluetooth, the Dual GPS Receiver will automatically connect to the device it was last paired with and you will be able to use it with hundreds of apps that require GPS location information. The XGPS150 also comes with a useful GPS Status Tool app that is available free on the iTunes store and will show your location, the number of satellites you are connected to, the battery level, and more. The XGPS150 includes a non-slip pad for use in your airplane, car or boat. A two-piece armband is also included for using the Dual GPS during hiking, geocaching, jogging, cycling and other outdoor activities. My iPad / iPhone already has a GPS - why do I need this? The iPhone and the 3G models of the iPad include an internal GPS, however the internal GPS is made for use on the ground and is not very reliable in the air. You will find that you experience intermittent outages from the internal GPS while flying. The Dual XGPS150 is a WAAS-enabled, super reliable and accurate, GPS receiver that you can count on both on the ground and in the air. Built in rechargeable battery. The battery powers the GPS for up to 8.5 hours of continuous use and recharges in about 3 hours. Small - only 2.25” square, 0.75” deep. 1.8 ounces. Pros: Size, ease of operation, value. Review: A basic unit that is simple to operate, easy to store, and that does the job. I've used it for about six months in 150s and 172s that are owned by our flying club, coupled to an IPad mini, running IFly GPS. This is my first gps receiver, so I have nothing to compare it to in actual use, but it has worked well. Review: It excels in guiding you from point a to b. Review: A must have if you are flying cross country using GPS on a personal device. Works fantastically with Droid EFB on my Samsung Tab 3. Haven't lost signal with this product yet. This Waas Based GPS is accurate and reliable for Situation awareness. Review: It met my expectations and was easy to use. It linked up with my IPad almost immediately, and was precise within 15meters horizontally, or better. Review: This product met my expectations for the program that I am working with which is Garmin BlueChart Mobile. The description of my position is not a 100% precise on the chart but enough to be very helpful no doubt about it !!! Review: I have yet to lose signal since using this. It is lightweight and does everything I could ever ask it to do. Worth the money. Cons: Sometimes my IPad loses connection with the receiver while in flight. Cons: Owner manual should be more detailed. Was this review helpful to you? Yes No 24 Other people found this review helpful. Was this review helpful to you? Yes No 15 Other people found this review helpful. Q: Will it work with Jeppesen FliteDeck Pro 9.0 which is for Windows? A: Yes, it will work with Jeppesen FliteDeck. You just need to make sure that your Windows laptop has Bluetooth capabilities. Q: Does the dual XGPS 150A Bluetooth GPS receiver work with the I-Fly GPS aviation navigation App? A: Yes, this work with the iFLY GPS App. Q: Will it work on a Ipad Air with no phone chip installed? A: Yes, it will work great with the iPad Air. Q: Does it work with Amazon's Fire tablet and WingX? A: Yes, this will work with any device that has a built-in Bluetooth and support the Bluetooth Serial Port Profile (SPP). The Amazon Fire Tablet has support for Bluetooth Serial Port Profile (SPP). Q: Does it come with a charger that plugs into an elec outlet (115v)? A: No, it does not have a wall charger. The XGPS150 is charged via the USB connector on the side of the device. To charge, simply connect the XGPS150 to the USB port on any computer using the included USB cable. A 12V cigarette lighter adapter is also included for charging the XGPS150 in a car or airplane. 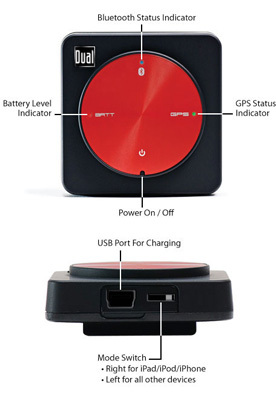 It takes approximately 2.5 hours to fully charge the XGPS150. Q: In all the comments I cannot see if it work the latest Ipad4! A: Yes, this is fully compatible with ALL iPad and iPad mini models. Q: Will this unit work with Garmin pilot App? I want to pair it with my Galaxy tab 10, will it work? Do I need to install any additional software or apps? A: The Dual XGPS150A will provide GPS information to a number of apps and will work with Garmin Pilot as well. It is compatible with the Galaxy Tab 10 and does not require anything other than a Bluetooth connection. Please note that this unit does not provide an internet connection or cellular data. It provides GPS information only. Q: Will it work with IPad mini 3G? A: Yes, this will work with the iPad mini (all models, including the 3G). Q: Will it work with Jeppeson FD? Thanks. A: Yes, this will work with Jeppesen Flight Deck. Q: Will it work with the ipad3? A: You bet, this is fully compatible with the new iPad 3! Q: will this item work for aviation navigation on a samsung galaxy tab 10.1? A: Yes, this will work on the Android powered Galaxy Tab 10.1. Q: Is this the new Dual XGPS150A? I ask, because the original 150 came with a 12 volt charger, while the 150A comes with a "28V Adapter" (according to Dual's website). Your webpage says that you are selling the "150" (no "A") and that it comes with a "12-30 volt charger." The plane that I fly will require a 28 volt adapter. A: Yes, this is the new A model (XGPS150A). The A model was upgraded it be 12-30 volt capacity instead of a fixed 12 volt capacity. Q: Can I use it with two iPads at the same time? A: This product can only connect to a single device at a time. Q: How is the GPS rechargeable battery charged ? Should it be charged only after it's charge is completely depleted or can it be charged at anytime ? Thanks. A: The Dual XGPS150 can be charged in the cabin with the included 12V cigarette lighter adapter or from a computer via the included USB cable. It can fully re-charge in about 2.5 hours and a full charge lasts for about 8.5 hours of continuous use. Q: Does it work with iPad 1 without 3g? A: Yes, it works with both the iPad1 and iPad 2 with and without 3G.